NEW YORK, November 28, 2018 /3BL Media/ — Institutional investors act when they hear how companies will create value over the long-term. 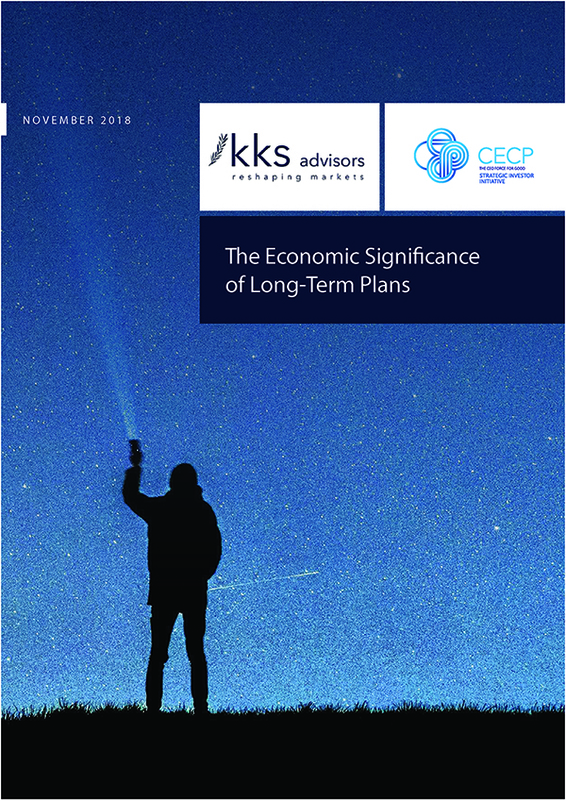 In a new study, The Economic Significance of Long-Term Plans published by KKS Advisors and CECP’s Strategic Investors Initiative (SII), an abnormal change in market returns and an increase in trade volume is observed after that company’s CEO presented a long-term plan to institutional investors. This is the first time the reaction to a CEO-presented long-term plan has been quantified and is early evidence that the audience of institutional investors find the information in these presentations decision-relevant. The study examined 21 plans presented by CEOs at CEO Investor Forums, scored the CEO presentations against 22 measures of content and quality, and examined the market’s reactions over a three- to five-day window after the plans were presented. For both stock prices and trading volumes, the delivery of long-term plans is associated with abnormal market returns of 1.83% and share turnover (volume) of 7.6%. Companies whose senior leaders communicated plans with higher-quality information are linked to larger capital market reactions. The data did not show significant difference in analyst revisions of their forecasts, which the authors note is consistent with sell-side analysts being primarily focused on short-term financial results. The presentations included in the study were delivered at SII’s CEO Investor Forums, which provides a platform for CEOs to tell their authentic long-term value story to long-term institutional investors. In addition to the 9 themes in the study, successful long-term plans also draw from the 7 question in the Strategic Investor Initiative’s Investor Letter to CEOs signed by Vanguard and other leading institutional investors. More than 30 CEOs and senior leaders have delivered or committed to deliver their company’s long-term plans at the Forums. Together these CEOs represent more than $2 trillion in market capitalization. The in-person audience for these presentations include institutional investors that represent more than $25 trillion in assets under management, as well as thousands who view the presentations live online. According to the authors of the report, to deliver a high-quality long-term plan, CEOs should touch upon the 22 topics summarized in 9 themes: Financial performance, Capital Allocations, Trends, Competitive positioning, Risk and opportunities, Corporate governance, Corporate purpose, Human capital, and Long-term value creation. Plans that detailed forward-looking metrics on these subjects were rated higher than plans that disclosed backward-looking data or were limited to boilerplate language. “The nine themes developed in this white paper offer a framework for CEOs to use in developing their long-term plans,” said Brian Tomlinson, Research Director, Strategic Investor Initiative, CECP. “The CEOs who have led the charge at our CEO Investor Forums have created a robust portfolio of long-term plan presentations. This research project provides a user-friendly guide to enable more CEOs to develop and present decision-relevant long-term plans.” Tomlinson co-authored the report along with Serafeim and the KKS Advisors team that included Sakis Kotsantonis, Managing Partner; Christina Rehnberg, Associate Consultant; and Bronagh Ward, Senior Associate Consultant. The Strategic Investor Initiative (SII) is a coalition of leading companies and investors committed to re-orienting capital markets toward the long-term. SII convenes CEO-Investor Forums to provide a venue for CEOs to share their long-term strategic plans with audiences of long-term investors. Through leading research, SII assists companies in developing and communicating long-term plans that help inform the decisions of institutional investors.